I don’t intend to use Roon with a physical library. It seems that one CPU limitation is dealing with large physical libraries. Nope - this is a false assumption. What matters is the size of your library, and hence the size and complexity of the Roon database. And the size of your library is determined by how many albums you have in it - whether these be physical local copies on a local hard drive, or albums that you have added to your library from a streaming service. That looks good. Too bad I have to order from Germany. Thanks for the quote. It’s pretty clear how he feels about his i7. I see. I currently use it on a 8650u quad core laptop. It works fine. I suppose I’ll just go i7. If like to confirm though if the database process is a single core process. Then I suppose the DSP processes are run on other cores which is why I suppose more cores are better? Or perhaps an older 2 core i7 might work? These new bean canyon NUCs apparently can get loud and while I like the Cirrus 7 after pricing it out loaded it got less palatable to me. Then I suppose the DSP processes are run on other cores which is why I suppose more cores are better? Or perhaps an older 2 core i7 might work? I’m starting to lean towards a custom build with a 9600k. Possibly try to build it fanless. I enjoy doing custom builds so this is up my alley. Combined with Akusa cases I think this will be my route. I just wonder if ROCK can be put on it. I don’t see a reason why not but maybe someone could let me know if there is a reason why not. Not sure if it is helpful. My ROCK runs on NUC7i3BNH, I have a smallish library of less than 1TB, no problem whatsoever, even when upsampling red book files to DSD128, everything is instantaneous. I just wonder if ROCK can be put on it. I don’t see a reason why not but maybe someone could let me know if there is a reason why not. ROCK (conceptually) has everything unnecessary removed. If your custom build hardware requires a driver for a peripheral (especially network chip) that is not included in ROCK or not already in use by one of the supported NUC, then you may experience problems. Search the forum for “MOCK” for this type of usage. If you decide to custom build one and you experience ROCK incompatibility, then install Windows. If you intend to run ROCK you should buy a NUC. Even if your MOCK works luckily, if a problem comes up in the future it makes it harder for support guys to support you. Thank you. Do you have any idea about the performance differences when running windows vs. ROCK on the same NUC? I’m wondering if the hit in performance with Windows is worth the speed increases offered by such a custom build. Windows is the fastest OS for Roon. ROCK is designed to be easier to use, manage and support. That settles it. I got a i7 NUC 8 and I’m putting Windows on it. No problem getting a key on eBay. I would never buy a key on eBay or even Amazon. Sometimes keys are sold that will only allow for installation on a vendor’s machine when it’s being built. Sometimes keys are sold that are already in use. Windows 10 does not require an activation key. It runs just fine – absent some trivial personalization settings – without activation, especially if used as just a server type machine. I bought a Windows 10 Pro key off Amazon for £10 just last week. It was an ‘Amazon’s Basic’ item and I received the key as soon as the payment had cleared through Amazons servers. Quick and risk-free. Many people have been burnt. Just a heads up. Hi, i m planning to build a server like nucleus+. I m planning to buy nuci7 on a fanless case + js2 uptone lps. Here are the specs i m planning to go for, please i need some advices cause i m not that technical. That Kaby Lake processor is almost 3 years old. That’s not necessarily a problem, depending on the money you’re spending. You can probably get a more current processor (7th or 8th gen) for about the same cost as one that is 3 years old. Don’t know the size of your library, but the base Nucleus is good for 100,000 tracks and up to 6 endpoints. That Nucleus only has an i3 chip. Of course, if you are exceed those specs or are going to do any DSP then you might need to build more. I have four endpoints and do DSP on some of them and I use ROCK on a 7th gen i5 NUC, without any problems. My library is under 100,000 tracks. All your other specs seem OK.
My library is under 100000 tracks i think. Thks for the head up, i will check a newer i7 . I dont t do dsp and upsampling, and only one endpoint. Don’t know what your wallet is or your future plans, but an i3 is probably all you really need. The issue with what you’re proposing is that it’s a so-called “MOCK”: it isn’t a NUC. It might work fine now, but you aren’t guaranteed it will in the future. 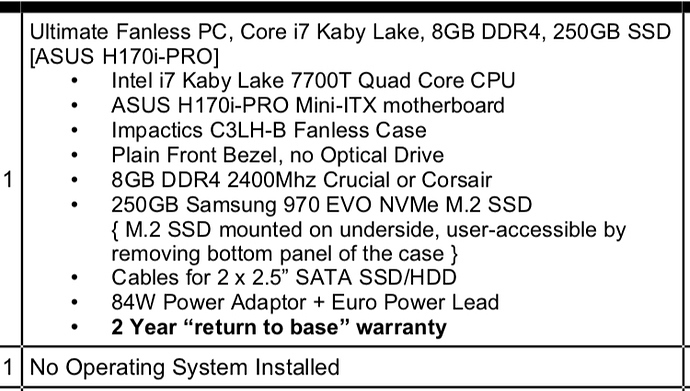 Instead of the current CPU / motherboard combo you have, you need to pick something from this list if you want to be reasonably sure it’ll work and be supported down the line. And if you’re curious, Roon’s CTO uses a NUC7i7DN* in his personal system.